SHELBY — Tricia Joyce is a state champion. 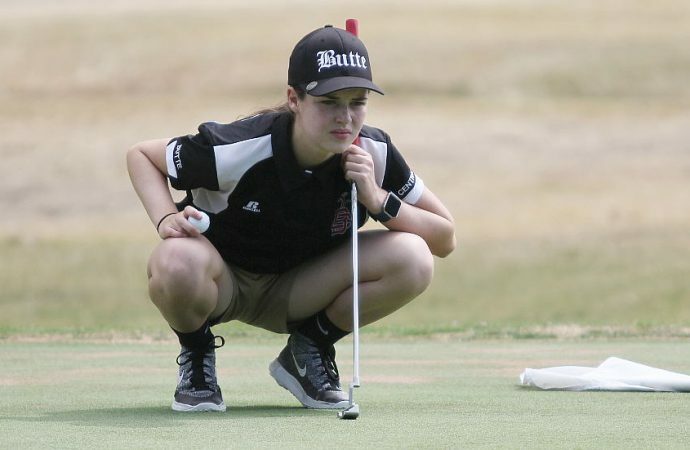 The Butte golfer fired an even-par 72 Tuesday for a come-from-behind victory in the girls’ 16-18 division of the Montana State Junior Tournament at Marias Valley Golf Course. Laurel Ward of Bozeman placed third at 152, while Hannah Rosanova of Bozeman shot 154 and beat Kelsey Irvin of Lewistown on the third hole of a sudden-death playoff for fourth place and a spot on the Junior Americas Cup and Montana-Alberta Junior Ryder Cup teams. Joyce, Esh and Ward will also compete on those teams. This will mark the second straight year that Joyce, who recently completed her sophomore year at Butte Central, will compete in both events. She also competed in the Montana-Alberta Junior Ryder Cup in 2015. The playoff was one of three on the day. Joey Moore made an eagle from 67 yards out on the first hole of a playoff to beat fellow Billings Golfer Caleb Trost to win the boys’ 16-18 division. Moore followed Monday’s 71 with a 66 for a 137 total. Trost, the defending champion, shot 65-72. Also, Liam Clancy of Park City made a lengthy birdie putt on the third hole of a playoff to beat Colton Hudson of Huntley for fourth place in the 16-17 age group and a spot on the Junior Americas Cup and Montana Alberta Junior Ryder Cup teams. The Girls Junior Americas’ Cup will be held Aug. 1-3 in Henderson, Nevada. The Montana-Alberta Junior Ryder Cup is Aug. 7-9 in Alberta.